On Sunday Donald Trump went on CNN and was asked once again about David Duke’s endorsement. Trump told Jake Tapper he didn’t know anything about David Duke or white supremacy. This sent shock waves across the liberal media and GOP establishment circles. Trump already disavowed David Duke’s endorsement on Friday. 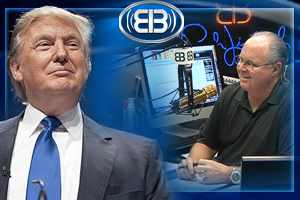 On Monday Rush Limbaugh suggested that Donald Trump was pandering to the KKK and racists because of polling numbers. That seems like quite a stretch, Rush. RUSH: Everybody is stunned over Trump. Nobody understands how Trump is still breathing. Nobody understands how Trump’s still pulling this off. You wouldn’t believe the theories that I’ve received from people sending me notes telling me what they think is really going on. And I guess the latest brouhaha with Trump is, he was on CNN with Jake Tapper yesterday, and he tried to act like he didn’t know what David Duke was, and he would not denounce David Duke nor would he denounce the Ku Klux Klan. Yet he had done so on previous occasions. He used to be in the Reform Party. Let me throw a theory out there to you. The Sunday shows have, amazingly still, their own separate and distinct stature. What is said on a Sunday show is treated differently and may be different in terms of its weight than what is said in a little sound bite that’s part of the nightly news, for example, or part of a guest appearance on a cable news show during the evening. A Sunday show, that’s stature, by reputation. A Sunday show is serious, no fooling around. It’s like “for the record,” what you say on the Sunday show. And it could well be that Trump thinks of it that way and just didn’t want the quote, did not want any sound bite from the Sunday show one way or the other because maybe Trump’s nervous. Maybe he’s nervous after that debate. Maybe he’s worried. The polls don’t indicate it. Maybe he’s worried that Cruz and Rubio are gaining on him, and he doesn’t want to tick off anybody that might vote for him. Hey, my speculation’s as good as anybody else’s, because I can think of no reason that he would purposely dodge, when he’s not dodged it before. I think about it being on a Sunday show, and that having more weight, more stature, something about it being these Sunday shows are TV shows of record, as opposed to your average cable news show which happens every day or every night. This theory did not go over well with the Trump supporters. @rushlimbaugh you sir have lost your soul accusing trump of SEEKING KKK endorse.thats slander.you r no different than beck, thru with you! Listening to #RushLimbaugh saying the only reason Trump dodged the KKK question w/Tapper is bc it was a heavily viewed Sunday show. Wow!! @rushlimbaugh is officially a LYING STINKING FILTHY POS. He just accused Trump of seeking the KKK vote because he fears Cruz. Incredible." Rush said, "Trump didn't want to tick off the KKK because he is worried about Cruz/Rubio." OMFG are you KIDDING me Rush? You are a POS.